Designers have to do a variety of tasks on daily basis on their workplace, their area of work ranges from business cards to logo designs, from typography posters to brochure designing, from packaging to the mockups. In everything what is demanded from them is innovation, ingenuity and inventiveness. It is actually difficult to create something new always because one can often get shortage of ideas. For that, looking up for the expert’s work available online is the best option to go about. It will give one plenty of ideas that how to make designs that look enticing and appropriate. No matter how vast a business can grow, they always need a proper channel to advertise about them because once you stop spreading about your perspective and stance people soon forget about it. You know it is said, ‘out of sight out of mind’, it so happens in this big world where the one who appears the most gets the most gaze by the people. Now a days people invest way too much on advertisements, they are not bothered about the expenses or the total cost it takes. If it is making them famous they will shed every penny after it. But not always one can afford to undergo massive expenditures that sometimes your budget doesn’t allow. 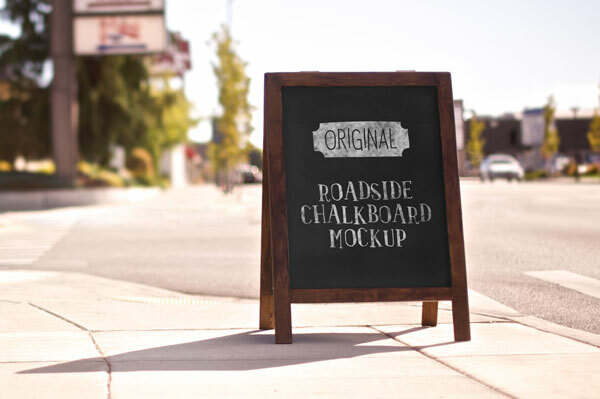 Today I am unfolding before you free roadside chalkboard mockup PSD. Have a look, use it by inserting in your own design and present it to your client to give him the idea that how his chalkboard placed on the roadside can look like in actual form along the roadside. Roadside chalkboard can be used to display menu, offers, daily discounts, opening time, closing time, event based sale, new product launch and you can also use it as a direction sign to indicate towards the store. So to make visitors easy to approach and locate the store on the road. Stay hooked for more freebies, we are here to accumulate the best kind of art and design posts that will help you out. Subscribe us for more posts in future as well and you will take benefit from each one of them.